Everything beginners need to start programming with Perl Perl is the ever-popular, flexible, open source programming language that has been called the programmers' Swiss army knife. 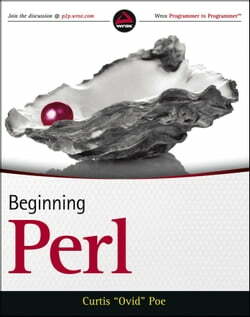 This book introduces Perl to both new programmers and experienced ones who are looking to learn a new language. In... read more the tradition of the popular Wrox Beginning guides, it presents step-by-step guidance in getting started, a host of try-it-out exercises, real-world examples, and everything necessary for a Perl novice to start programming with confidence. Introduces Perl to both new programmers and experienced ones who want to learn a new languageProvides a host of real-world applications for today's environments so readers can get started immediatelyCovers the new features of Perl but fully applicable to previous editions Beginning Perl provides the information and instruction you need to confidently get started with Perl. For Instructors: Classroom and training support material are available for this book.